To see the article as it appeared in the January-February 1999 issue, click here. 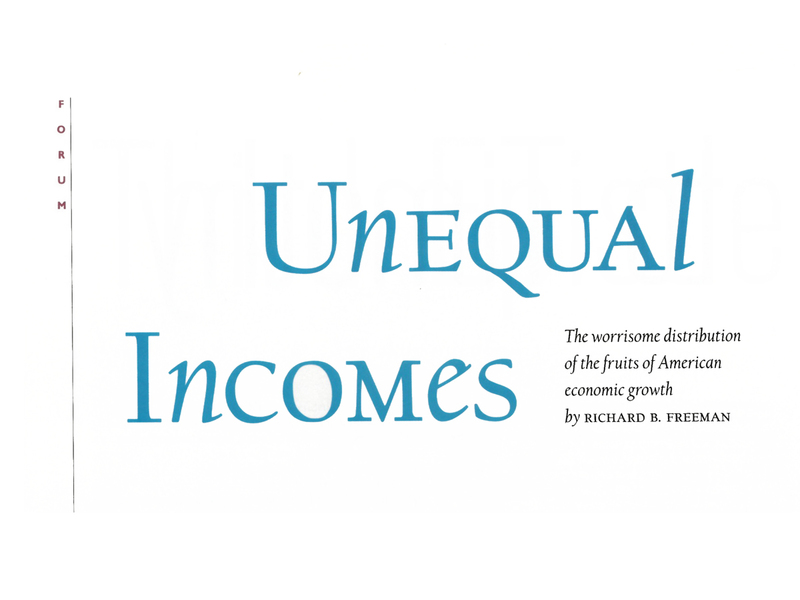 In an era of widening income inequality—with all it implies for American political and social cohesion—we take a look back 20 years to Ascherman professor of economics Richard B. Freeman’s prescient, and still very pertinent, overview of the problems and challenges. His more recent essay for the magazine, “Who Owns Robots Owns the World,” examines a new dimension of concern: the possible loss of jobs and income to automation, in a system that increasingly distributes economic rewards to the owners of capital, away from labor. By many measures, the U.S. economy has performed well in recent years. the statistics on employment, inflation, unemployment, manufacturing productivity, and the federal deficit are exemplary. At economic summit meetings with the Europeans and Japanese, President Clinton and his team have a lot to crow about. There is, however, one glaring exception to this record of American economic success: the distribution of the nation's output. The United States has the most unequal distribution of income among advanced countries--and the degree of inequality has increased more here than in any comparable country. The earnings, adjusted for inflation, of workers in high-paying occupations--chief executive officers and professional athletes, to name the most prominent--have risen rapidly, while the earnings of the majority of the work force have barely kept pace with inflation and the earnings of less-educated and lower-paid workers, adjusted for inflation, have fallen. The income of the average family has increased, but largely because women are working more. And the vast bulk of the increase in family incomes has accrued to the top 20 percent or so of the income distribution. The share of income going to the top fifth rose by 13 percent between 1979 and 1996, while the share going to the bottom fifth fell by 22 percent during the same period. As a result, in 1996, the fortunate Americans in the top fifth of the distribution commanded 47 percent of the income--11 times as much as those in the bottom tier. Within the top fifth, moreover, the big gainers were those in the upper 5 percent, whose share of income rose from 15 percent to 20 percent. While the data are more problematic, families in the upper 1 percent of the top 5 percent appear to be even bigger gainers. At economic summits, the president and his team do not brag about how the United States has distributed the fruits of economic growth. Historically, economic booms have benefited workers in the bottom parts of the income distribution. But the benefits to ordinary working Americans of the current long-running boom have been anemic at best. The incidence of poverty has barely changed, particularly among children, where the pattern of high inequality in the United States is replicating itself. Measured in terms of purchasing power of currencies, children from families in the lowest fifth of the U.S. income distribution are poorer than comparable children in the lowest fifth of the earnings distribution in almost all other advanced countries. But children from families in the highest fifth of the distribution have higher incomes in the United States than in other countries. Less-educated young men, for whom the economy seems to have little need, are increasingly ending up in prison or jail. The homeless population, which we thought would diminish with economic growth, remains steady at half a million or so people. Should we worry that the rising economic tide has failed to raise the wages of the majority of the American work force? Is this a subject for national concern and public or private action? Should we care that lower-income workers have falling wages (adjusted for inflation)? That health care and private pension coverage are becoming less available to low-wage workers? That poverty and homelessness are increasingly unresponsive to economic conditions? That the fastest-growing occupation for less-educated young men is prisoner? In the midst of a cyclic boom, many find it hard to worry about much of anything, and prefer pat answers to serious concerns. The real earnings of most workers are stagnant or falling? There must be something wrong with the consumer price deflator used to measure inflation and translate nominal wages into their value adjusted for changes in prices. Americans are working more hours than the Europeans, and seemingly the Japanese as well, to maintain our living standard? Families need two earners to make it in the United States? Well, we've got to work hard to beat everyone in the global market. Low-wage workers lack pension or health benefits? Not at my firm. We contract out cleaning the buildings and that kind of stuff. Less-educated workers are suffering real earnings declines? Let them eat cake--er, go to a university and get with it. The poverty rate doesn't drop despite the economic boom? Have faith, full employment must reduce poverty eventually--if not this year, next year, or surely the year after. And as for those homeless people, there are jobs aplenty, so they should get some work and stop clogging the sidewalks. There's something awry with the distribution of income? But the United States has full employment, and the prices of computers fall every year. Relax and let the good times roll. Beneath the rosy conditions and apparent good times, the economic statistics and social indicators suggest reasons for concern. Despite America's excellent employment record, our economic output per capita has grown no faster than that of the European Union countries--the supposed sick men of the modern global economy. And productivity, the measure of economic efficiency, has grown more slowly than in many of those countries. Comparisons of different countries' economic growth over short periods of time depend in part on the years chosen and on economic cycles. Bearing that in mind, from 1979 to 1996 American economic output per capita grew more slowly than that of almost all other advanced countries. So we are working more than Europeans and (according to Organization for Economic Cooperation and Development data) even more than the industrious Japanese, but with no better results as measured by the increase in what we produce per capita. Despite our boom, we have not solved the fundamental problem of finding jobs that pay less-skilled workers decent wages. Imprisonment of 1.7 million predominantly young men, disproportionately African American, is an incredibly expensive way to control crime--and a waste of human potential. Incarceration costs as much per year as going to Harvard. Despite our boom, not until the last year or two has the real pay of lower-wage workers risen. This is disturbing because traditionally booms have been the periods when lower-paid workers have enjoyed their most rapid wage increases, and they have a long way to go to regain their living standards. Over the past quarter century--unprecedented in modern American economic history--the real wages of low-income workers, especially young men, have fallen by 20 to 25 percent. Economists debate the reasons for the long period of decline: increased foreign trade, technology, declining unionization, immigration--all seem to have some effect, and none of these factors seems likely to move in favor of the low paid. Will these workers ever catch up? And what will happen to their earnings if the country hits a recession? Despite the boom, personal bankruptcies are at an all-time high, and the risk of consumer credit defaults is rising, as Americans' credit-card debt has nearly doubled over the past five years. What will happen to consumer spending and the banking system if workers with large debts lose their jobs in a recession? Despite the high economic returns secured by those who complete a college education, enrollment of students from low-income families has changed relatively little. Enrollments have grown substantially in the late 1980s and 1990s, but largely because children from middle- and upper-income families have chosen the college-to-career route. How can young persons from families at the bottom of the income-distribution scale attain the training they need to secure jobs with the pay that will give them a decent economic life? And, despite the long-term increase in the real wages of college graduates, their real starting pay has been falling for the past few years. What will happen to new entrants into the job market if the economic boom falters? Despite the attention given to the 1997 United Parcel Service strike and new AFL-CIO leadership, trade unions--the institution that has traditionally helped bring working families into the middle class--remain in difficulty. The union share of the work force has declined year after year. If unions cannot increase membership in a boom, what will be their fate in a recession? Despite the many economic problems of lower-paid Americans, most recent legislative initiatives are oriented to lowering the tax burden for upper- and middle-class earners, perhaps because voting varies greatly by income, and because low-income Americans cannot contribute much to increasingly expensive political campaigns. In short, the natural cures that most economists hoped would improve the position of the lower paid have as yet not been effective. If the United States sustains full employment for the next five to 10 years, perhaps these cures will kick in with a vengeance. It is possible that the economy has entered a new zone of persistent low unemployment and low inflation that will ultimately benefit even the lowest-paid Americans. But it is more likely that we will experience a few negative "shocks" in the next few years. It is conceivable (some would say most probable) that inflation will rise for unanticipated reasons: changes in exchange rates; downturns in foreign markets that spill back onto the United States; a resurgence of rising health-sector costs. In such a situation the Federal Reserve Board will surely react by inducing or permitting a recession to curb inflation. Because we have been lowering the "social safety net" to impel less-skilled workers to get jobs--a reasonable strategy when the jobs are abundant in a boom--the unintended consequence will be that the bottom will literally fall out for Americans at the bottom of the income distribution. Most worrisome over the long term is the possibility that we are erecting for the foreseeable future a new pattern of inequality that bifurcates U.S. society between increasingly remote "haves" and "have-nots." This is a phenomenon that I have called an "apartheid economy" (in the Harvard Business Review, of all places! ): you and I live in our suburb while those "other" folk live somewhere else in the city, largely invisible to us. Economists are a dismal lot. We worry when the economy booms and when the economy shrinks. We worry when the dollar goes up and when it goes down. It's part of the territory. But the dismal vision of an economic boom that does not greatly improve the earnings of ordinary workers nor reduce poverty is truly something to worry about. Perhaps the best way to summarize current American economic policy is as a gamble. We have bet that we can maintain unemployment at lower rates than the Federal Reserve and most economists thought were compatible with stable inflation, and that we can avoid the business cycles that have historically devastated jobs and profits. We have rolled the dice on the hope that low unemployment will, ultimately, give ordinary Americans the raise that they have not had in years. If the gamble does not pay off and we hit a big recession, the United States will face truly troubling social problems, and a magnified set of issues regarding the distribution of economic output and the access of normal citizens to health care, educational opportunities, livable retirement income--all the things that make up the American Dream. For those no longer protected by the social safety net, there will be problems of putting food on the table, of securing clothing and housing. So, as the good times roll, shouldn't we think about ways to give normal working Americans a greater share of the fruits of economic growth--about ways to provide a bit more insurance for those in the lower parts of the earnings distribution? Hedging and arbitrage and diversification have some value, as most financial analysts know--and gambles can turn bad, as most gamblers find out. Richard B. Freeman, Ph.D. ’68, is Ascherman professor of economics at Harvard, director of the labor studies program at the National Bureau of Economic Research, and director of the program for discontinuous economics at the London School of Economics. He is the author, most recently, of Working Under Different Rules (1995) and When Earnings Diverge (1997). His new book, What Do Workers Want? written with Joel Rogers, is scheduled for publication by Cornell University Press in 1998.